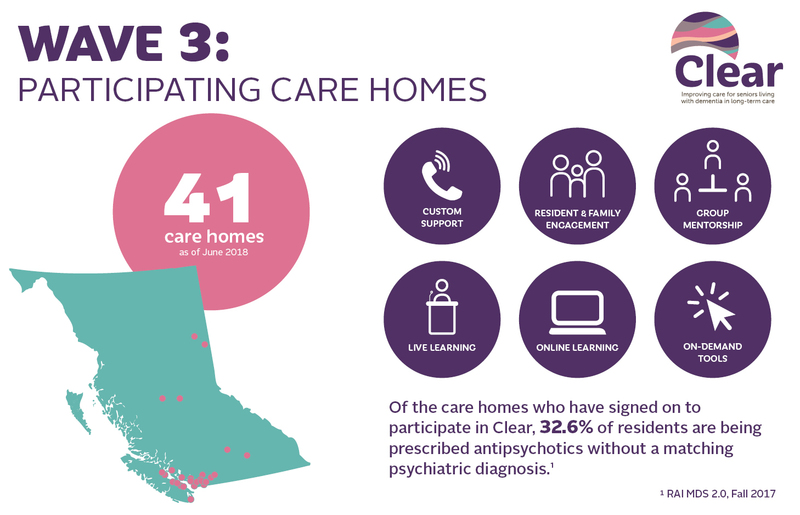 Clear is supporting long-term care homes in BC to provide person-centred care for residents with the behavioural and psychological symptoms of dementia (BPSD). Clear is a clinical quality improvement initiative guided by Choosing Wisely’s recommendation on using antipsychotic medications to treat BPSD in cases where nonpharmacologic measures have failed, and where the symptoms either cause significant suffering, distress and/or pose an imminent threat to the patient or others. 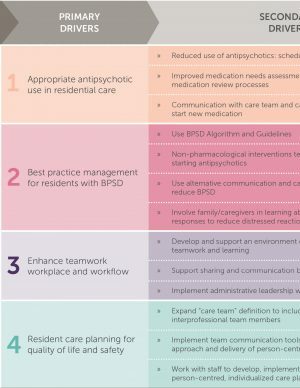 Wave 3 is supporting care homes across the province whose use of antipsychotics (without a diagnosis of psychosis) is higher than the BC average of 25%. This includes both affiliated and health authority owned-and-operated care homes and represents the most care homes to ever participate in Clear. We’re excited to see what they accomplish together! Each care home that is participating in Clear has an Action & Improvement Team that is leading its work in the initiative. Teams will work together, learning from our team, clinical faculty, guest speakers and care homes that previously participated in Clear. The initiative began in December 2017 with a series of leadership preparation webinars to help clinical leaders and directors of care build their Action & Improvement Teams. Five regional Kick-Off Workshops in the Spring of 2018 and five Regional Workshops in the Fall of 2018 brought the teams together to connect and share learning. Regular monthly webinars provide education and tools for relevant challenges teams are facing. Currently the Action & Improvement teams are planning for sustainability with the support of their improvement advisors. We’ve developed and gathered a number of resources to help Clear’s Action & Improvement teams, in a new and revamped Resources Page for Teams, Physicians and Families & Caregivers. 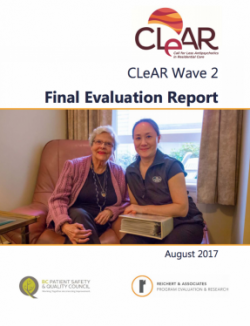 Forty care homes participated in Wave 2 of Clear, from September 2015 through December 2016. Collectively, they made a tremendous impact – reducing or discontinuing antipsychotics prescriptions for 1,001 residents. These results – and many more – are captured in a commissioned evaluation of Wave 2. Registration for Action & Improvement teams is closed, but you can still join as a Supporter to receive Clear newsletters and access to most resources. Clear is guided by a Faculty which includes many clinical experts in seniors care and dementia, as well as a Partnership Alliance which ensures Clear aligns with similar initiatives. Clear Faculty are clinical experts from throughout the province who have knowledge and expertise in many aspects of this initiative. They will provide expert advice, coaching and mentorship to participating teams. This will be done in several ways: local workshops, provincial webinars, email, and team or individual calls. The Partnership Alliance represents key stakeholders in the field of dementia care, who provide overall guidance to Clear and identify opportunities for alignment between partners and Clear.